In 1972, when I was the BBC's Ireland correspondent, it would have seemed like the most absurd fantasy that the Queen would ever shake hands with a leading figure from the Provisional IRA. And although there were some slightly more moderate figures within the organisation, Martin McGuinness was not one of them. He was an out-and-out extremist. I remember driving through the Bogside in Derry late one evening with a newspaper correspondent when we realised Martin McGuinness and one of his associates were in a car behind us. They must have followed us for 15 minutes after that. Both of us were really scared. "Christ," said my friend. "He's the one they call the Butcher of the Bogside." When, eventually, the other car peeled off, my friend and I stopped and shook hands with each other, as if we had just escaped a particularly nasty death. Martin McGuinness's friend and ally, Gerry Adams, was also a man to fear. After he was said to have become the commander of the Belfast Brigade, the practice began of "kneecapping" people regarded by the IRA as traitors or criminals - that meant they would be shot through the knees. No one who has watched, as I have, a teenager writhing on the ground, begging to be put out of his agony, will ever forget it. Atrocity followed atrocity in what became a small but very nasty civil war. I got to know a number of senior Provisional IRA people and their political supporters - and even liked one or two of them as individuals - but I always felt that if I saw Martin McGuinness or Gerry Adams coming, I would rather cross the street than shake hands with them. Yet shaking hands is precisely what the Queen has now done, in spite of all the people who have been blown up and murdered, including her own cousin, Lord Mountbatten. And McGuinness's decision to shake hands with the Queen is one of the bravest and most statesmanlike gestures an Irishman has ever made. There are people in Ireland, north and south, who would never have supported the Provisional IRA, yet would still recoil from doing such a thing. Signing the Good Friday Agreement was brave enough. Martin McGuinness has now made himself even more of a target for the Republican extremists and irreconcilables - they may be few in number, but they have demonstrated their continued ability to kill and maim. There is, of course, a precedent. Michael Collins, the leader of the IRA in its war against Britain from 1918 to 1921, came to London to negotiate the treaty which would establish the beginning of Irish independence. Winston Churchill, who was responsible for policy towards Ireland in the British cabinet, regarded him as the worst kind of terrorist. Yet slowly, as the negotiations dragged on, the two men came to appreciate each other's remarkable qualities. At one point when the things seemed close to breakdown, Churchill suggested to Collins that they should go and talk it over between them. They stayed up almost the entire night, drinking heavily, singing songs and reciting poems to each other. By the morning they had established enough of a basis for the talks to continue successfully. Yet signing the treaty was Collins's death warrant - soon afterwards, back in County Cork, he was ambushed and murdered. Things are very different now. 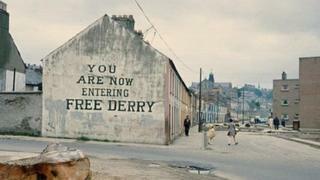 The Good Friday Agreement has stood the test of time, and does not need shoring up. All the same, there has been a real need for a symbolic gesture to bring the years of discord to an end. The Queen's hugely successful visit to the Irish Republic last year was part of that, but one more symbol of reconciliation was required. With great courage and forgiveness on both sides that has now been achieved.